Recent Chinese summer blockbuster film Wolf Warrior 2 has achieved the highest box office record of all time in China and is possibly the most popular film in China in contemporary time. (MTime.com, BBC) It celebrates an ex-military Chinese hero Leng Feng and how he helps to resolve some local conflicts in Africa. Its popularity has a lot to do with its celebration of nationalism and one question is: what do people in Africa think? There is in fact very little written about this. What I wish to do here is to present some alternative thoughts, with the help from Seth Avusuglo from Ghana. Are Chinese films or other cultural productions visible or popular in Ghana? Chinese goods are ubiquitous part of our lives in Ghana. However, we are not as privy to Chinese cultural productions as compared to its incredible industrial capability. This wasn’t the case in the past. My generation grew up liking Chinese movies and dramas. As a kid, I wouldn’t miss Journey to the West on TV. Television was relatively scarce, but I had to find a place to watch anyway. Interestingly, this was a production by China’s state media in the 1980s. The country was poorer and more closed. So the soft part of China’s rise (at least in the cultural spheres) hasn’t kept pace with its industrial prowess. Certainly, there are reasons for this beyond China’s influence. Is Wolf Warrior 2 going to be released in Ghana or other African countries? How would you predict its general reception? It hasn’t been shown in Ghana yet. Not sure for the rest of the continent. But assuming it were shown, I reckon the response would be more muted than enthusiastic. To most, it will just be another foreign movie trying to tell part of the African story from a narrow point of view to a targeted audience. Only a marginal fraction of the middleclass here go to the cinemas. These educated people won’t be comfortable with any negative portrayals. The depiction of Africa in the foreign media is already a hot issue of discussion. So this won’t sit well with them. It would only be viewed as a hotchpotch of how not to tell the story of Africans. What kind of message do you think Wolf Warrior 2 is trying to communicate with the audience in Africa and the audience in China? Obviously, the target audience is the Chinese. The clear message is the arrival of China on the world stage. A China that will be there for its people abroad. Unusually, China launched missiles at the country and extracted people, with no impact on the conflict itself. 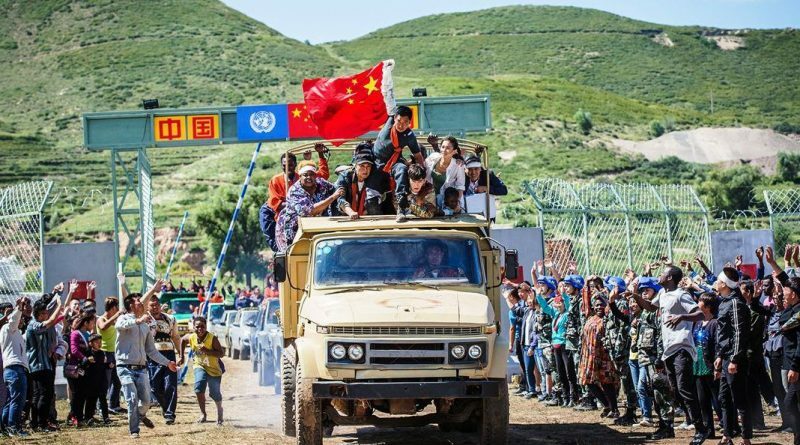 Despite Chinese peacekeepers on the ground in the end, did the Chinese do enough to save local lives? Most civilians were left behind. Why not care about the poor and vulnerable? I hope the Chinese audience had these questions in mind. We got the message too; China will protect its citizens and interests as the continent’s biggest investor with a huge population here. This was clear in the efforts to extract Chinese nationals and the warlord’s apprehension to harm them. This was about China’s perception about Africa too. The portrayals were familiar. You can find any story you want on this big continent. However, this one-dimensional view is not helpful. We in Africa have internalised this stereotype, and grown blasé to its self-perpetuating ills. China has always presented itself as a different foreign power. This movie fell short of selling that message. China has been expanding its visibility in Africa, in terms of investment, infrastructure development, business and military cooperation. In your opinion, does the film represent the current situation in Africa well? Certainly, the movie showed traces of Chinese influence; from a manufacturing plant to a Chinese medical facility and personnel trying to find a cure to a battering epidemic. Chinese investments in Africa have generally been refreshing to development efforts here. My concern has always been about our African governments who need to get serious about economic development here. For future Chinese blockbuster productions, we will certainly continue to see an increase of contents related to Africa or African, what would you want to see in these films? There are certainly going to be a lot more Chinese productions with African themes. I only hope they tell more rounded stories from the continent. By the way, you know the story about Chinese and American nuclear scientists cooperating with their Ghanaian counterparts to rush out bomb-grade nuclear fuel from Ghana. In this real life story, Chinese and American nuclear experts collaborate to hatch a plan for this mission which took a decade to execute. This was done at the behest of an African government committed to nuclear safety and non-proliferation. Such a story could make a good movie; China playing an essential role in safeguarding our planet and an African government showing an untrammelled commitment to an international norm. A win-win for us all. Also, the huge Chinese population here means you can always find some inspiring stories to tell at the people to people level. So I hope there is more diversity and nuance in the future storytelling with an African theme.